adequate supply of pre-hospital care equipment and facilities (enough ambulances and other medical supplies). 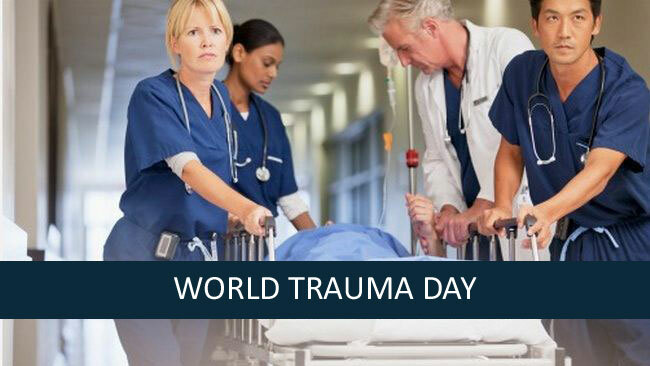 Commemoration of World Trauma Day emphasises the importance of saving and protecting a life during the most critical moments and preparing and applying critical measures to deal with and avoid trauma fatalities. Every year, 17th October is celebrated as World Trauma Day. This day highlights the increasing rate of accidents and injuries causing death and disability across the world and the need to prevent them. Trauma means “any injury caused to the body”. The injury may be caused due to many reasons like road accidents, fires, burns, falls , acts of violence and crimes against the vulnerable population including women, children and elderly. Amongst all the causes, Road Traffic Accident (RTA) is the leading cause of trauma across the world. Many injuries may lead to temporary or permanent disability while others may even cause death. Every year, about 5 million people die from injuries across the world. In India alone, it is estimated that one million people die and 20 million are hospitalized every year due to injuries. According to National Crime Records Bureau (NCRB), about 1,37,000 people died in road accidents in India in 2013. The burden of disease due to trauma is increasing at an alarming rate. This not only increases the morbidity and mortality rate, but also affects the national productivity on account of younger population being mainly involved in road accidents. Therefore, we should all take the required precautions in order to prevent any injuries. Road designing plays an important role in preventing trauma. But the rate of injuries due to trauma cannot only be reduced by adequate road designing. It is the duty of every citizen of every country to act responsibly. Remember, prevention is always better than cure. Trauma is no accident. It can be easily prevented by staying alert. So, help yourself as well as others by acting responsibly.